Dyskeratosis congenita is an inherited bone marrow failure syndrome whose characteristic features are nail dystrophy, abnormal skin pigmentation and mucosal leucoplakia . There are X-linked, autosomal dominant and recessive forms of the disease. The X-linked form is due to mutations in the gene, DKC1, which codes for the nucleolar protein dyskerin . Dyskerin is a component of snoRNP complexes involved in rRNA maturation  and is also associated with the telomerase complex . Autosomal dominant DC is due to mutations in the gene, hTERC  encoding the telomerase RNA component, suggesting the pathology of DC is largely due to defective telomerase. The recent finding of hTERC mutations in cases presenting with aplastic anaemia [6, 7] has introduced the possibility that defects in telomerase may be more widespread than previously thought. Paroxysmal nocturnal haemoglobinuria (PNH) is a clonal blood disorder which often develops in association with aplastic anaemia . In PNH a somatic mutation in the PIGA gene disrupts the synthesis of GPI anchors resulting in the growth of one or more clones of GPI- blood cells (which lack GPI anchored proteins such as CD55 and CD59) . It is presumed that these cells survive in the aplastic marrow because they evade the insult that is killing the other cells (GPI+) and leading to aplasia . The nature of the insult is not known but it is presumed to involve one or more GPI linked proteins. PNH is not known to be inherited. While there are cases of familial or constitutional AA the vast majority of cases are idiopathic. However the observation that idiopathic AA often occurs after exposure to a drug or other chemical that many people are exposed to suggests that there may be a genetic predisposition to the development of AA. Here we present a case of PNH in which the proband was found to have a mutation in an Sp1 binding site in the promoter of hTERC. In vitro analysis of the mutated promoter suggests the mutation may affect hTERC promoter activity and thus might influence telomerase levels. An 18 year-old Turkish man presented with a three month history of fatigue, nose and gum bleeding. He was found to have pancytopenia at his local Hospital and was referred to the Haematology Department of the Cerrahpasa Medical Faculty (University of Istanbul) in August 2001 for further management. His past medical history was unremarkable and there was no recent exposure to chemicals or drugs. Physical examination was unremarkable except for marked pallor and petechiae. Spleen was not palpable. His initial investigations were as follows: Hb 4.1 g/dl, WBC 1.4 × 109/l (0.6 × 109/l neutrophils), platelets 10.0 × 109/l, reticulocytes 0.4%, MCV 115.4 fl. Blood film showed anisocytosis with prominent poikilocytes and polychromasia. The serum iron, iron binding capacity, vitamin B12, folic acid and haptoglobin measurements were within the normal range. His LDH and indirect bilirubin were slightly elevated. Bone marrow biopsy revealed variable cellularity between <5% to 60%. Cellular parts of the marrow displayed focal erythroid hyperplasia with megaloblastoid and dyserythropoietic features. Myelopoiesis was relatively reduced and some megakaryocytes were present. Direct Coombs test was negative. Hemosiderinuria was detected. Flow cytometric analysis revealed absence of CD55 and CD59 on all granulocytes consistent with a diagnosis of PNH. He was initially treated with prednisolone (1 mg/kg/day). A moderate increase in the Hb level and reticulocyte counts (4.6%) was noted lasting a few weeks. No improvement was seen in the leucocyte and platelet counts. In November 2001 his blood count was as follows: Hb 4.7 g/dl, WBC 2.4 × 109/l, platelets 17.0 × 109/l. He was cushingoid and developed steroid induced myopathy. The prednisolone was discontinued and he was supported with erythrocyte and platelet transfusions. His blood counts were January 2002 (Hb: 4.5 g/dl, WBC 2.5 × 109/l, platelets 60 × 109/l), December 2003 (Hb:5.5 g/dl, WBC 2.9 × 109/l, Hct: 16%, platelets 13 × 109/l). In July 2002 an archived DNA sample was sent to the Department of Heamatology, Hammersmith Hospital to screen for mutations in the hTERC gene. In December 2003 DNA extracted from a buccal smear was screened for hTERC mutations. A 654 bp fragment encompassing the hTERC gene was amplified by PCR with the primer pair 5' TCATGGCCGGAAATGGAACT3' and 5'GGGTGACGGATGCGCACGAT3' using the conditions described previously . Fragments were screened for mutation by denaturing high performance liquid chromatography (dHPLC) using the Transgenomic WAVE DNA fragment analysis system. When an abnormal pattern of elution was observed, the sample was re-amplified and subjected to direct sequence analysis by BigDye chain termination cycle sequencing. The products of the reaction were run on a 3700 DNA analyser and the sequences read using the EditView automated DNA sequence viewer (Applied Biosystems Inc). Restriction enzyme digestion of PCR products was carried out according to manufacturers instructions (New England Biolabs). Nucleotides corresponding to promoter sequences are given in uppercase letters from 5' end to 3' end. Lowercase letters indicate clamps for introduction of restriction enzyme sites. Bold indicates mutation. 3.0 μg of hTERC promoter plasmids containing firefly luciferase reporters were cotransfected into 5637 bladder cancer cells with an internal Renilla luciferase control, pRL-SV40 (Promega) using Superfect Transfection Reagent (Qiagen) as previously described [10, 11]. The total amount of DNA was kept constant at 10 μg with Salmon sperm DNA. The activity of both firefly and Renilla luciferase was determined 48 h later using the Dual Luciferase Assay kit (Promega). A minimum of three independent transfections were performed in duplicate and specific hTERC promoter activity was normalized to protein as described elsewhere [10–12]. Nuclear extracts from cultured 5637 cells were made according to our previous study . EMSAs were performed using the EMSA kit (Promega, E3300). 5.0 μg of nuclear extract proteins were incubated in 15 μl of reaction containing 4% glycerol, 1 mM MgCl2, 0.5 mM dithiothreitol (DTT), 0.5 mM EDTA, 50 mM NaCl, 10 mM Tris-HCl, pH7.5 and 2.0 μg poly(dI-dC) with or without 100-fold molar excess of unlabeled DNA competitors on ice for 15 min, followed by addition of the radiolabelled probe. All DNA-protein complexes were resolved by electrophoresis on 5% native polyacrylamide. In a screen of aplastic anemia samples for hTERC mutations we found a changed dHPLC elution pattern in a Turkish PNH patient. We subsequently analysed 12 other PNH patients in our collection and all appeared normal on dHPLC. DNA sequence analysis showed that the abnormal sample was heterozygous for a C->G substitution, 99 bp upstream of the hTERC transcript (Figure 1). Since this mutation results in the loss of an AvaI site present in the normal hTERC gene, we were able to confirm the presence of both mutant and normal alleles in this sample by restriction enzyme digestion of the appropriate PCR product (data not shown). 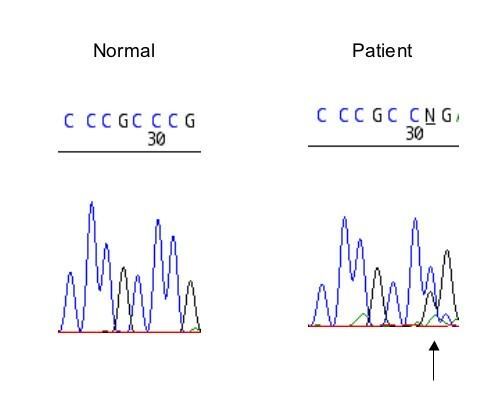 This mutation was detected by dHPLC analysis in DNA extracted from a buccal smear taken from the patient, indicating the mutation is constitutional. It was not detected by denaturing HPLC analysis in 100 ethnically matched DNA samples. The C-99 residue is located in a core binding sequence for the Sp1 transcription factor (site Sp1.2 ). The mutation changes this sequence from 5'CCGCCC3' to 5'CCGCCG3'. We postulated that the mutation might disrupt the Sp1 binding to the hTERC promoter. Initial analysis of transcription factor binding sites in the mutant sequence using the TRANSFAC search tool revealed that the predicted Sp1.2 binding site was lost in the patient mutant sequence. Sequence of hTERC in the patient. Sequence traces show that the patient is heterozygous for a C->G substitution (arrowed) upstream of the hTERC gene. In order to determine whether the patient C-99G mutation functionally affects Sp1 binding to the Sp1.2 site, we first examined the ability of the mutant sequence to bind Sp1/Sp3 in electromobility shift assays (EMSA). We previously demonstrated by supershift analysis that Sp1/Sp3 bind double stranded oligonucleotides corresponding to the Sp1.2 site with low affinity in vitro but do not bind an oligo in which C-101/C-100 are replaced with AA  (Figure 2, h41 m). We now constructed oligos in which C-99 was replaced with A (h43 m) or with the G substitution found in the patient (h42 m). Excess of either cold A-99 or patient G-99 mutant failed to compete with the wild type Sp1.2 oligo for Sp1/Sp3 binding, indicating that an hTERC promoter mutation identified in the PNH patient disrupts the ability of Sp1/Sp3 to bind a regulatory site in the core promoter. To confirm disruption of Sp1/Sp3 binding, labelled h42 m and h43 m oligos were incubated with 5637 cell nuclear extract, but did not form retarded complexes although complex formation was seen with the wild type Sp1.2 oligo (data not shown). Band shift analysis. 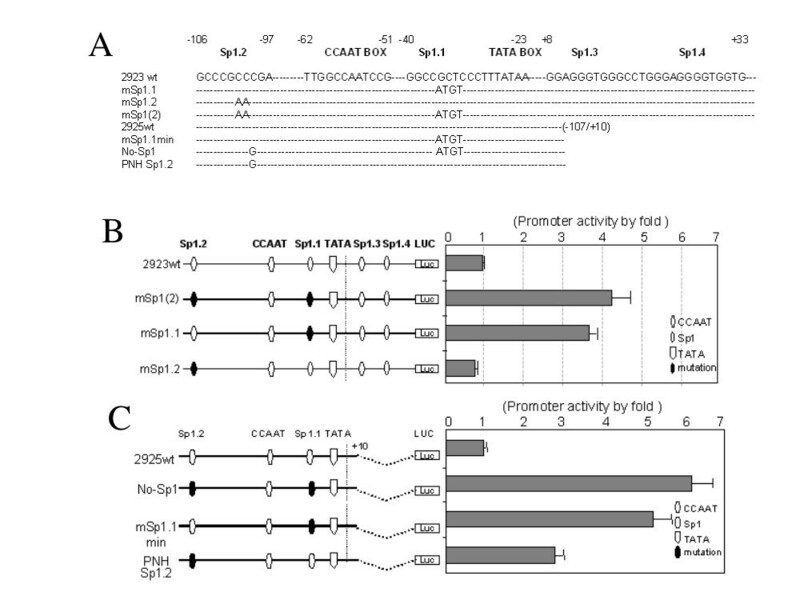 A. Oligonucleotides used in EMSA and mutagenesis studies of the hTERC promoter. The sequence of the wild type oligonucleotides covering identified transcription factor Sp1.2 binding sites are shown as h41. The colon symbol represents bases identical to those in the top row, the mutant sequences are shown underneath. B. Single mutation in Sp1.2 site inhibits the Sp1 binding activity. 5637 nuclear extract was mixed with radiolabelled oligonucleotide probe and analysed by EMSA. Specific DNA/protein complexes are indicated by the arrow on the right hand side. The oligonucleotide h41 was used as a probe and the oligonucleotides used as competitors are indicated at the top oflanes 2–5. To investigate whether the loss of Sp1/Sp3 binding might have functional effects on the activity of the hTERC core promoter we constructed wild type and mutant hTERC-luciferase reporter plasmids and analysed relative luciferase activity by transient transfection in 5637 bladder cancer cells. We previously showed that the activity of the core hTERC promoter is regulated by Sp1 sites surrounding the CCAAT box (Sp1.1 and Sp1.2) and by Sp1 sites downstream of the transcriptional start site which have a general repressive role (Sp1.3 and Sp1.4). Removal of the downstream sequence encompassing nucleotides +11 to +69 leads to an approximately 2.5-fold induction in core promoter activity [11, 13]. We now examined the effects of the patient C-99G mutation on hTERC promoter activity in the absence of downstream negative regulation using this minimal construct comprising Sp1.2, CCAAT and Sp1.1 (nucleotides -107 to +10). Consistent with our previous analysis, mutation of the Sp1.1 site led to strong induction of core promoter activity, confirming a repressive role for this site (figure 3C). In the minimal promoter context a single mutant construct harbouring the Sp1.2 C-99G mutation had an increased reporter activity, suggesting that this site acts as a repressor of transcription. Additionally, the combined ablation of both Sp1.2 by the PNH C-99G substitution and Sp1.1 led to a weak further increase in promoter activity relative to the Sp1.1 single mutant. Interestingly, we previously observed that inactivation of Sp1/Sp3 binding to Sp1.2 in the context of the larger core promoter (-107 to +69) by a C-101A/C-100A double substitution (mSp1.2, figure 3B) results in a slight decrease of hTERC promoter activity, identifying Sp1.2 as a positive regulator of hTERC transcription (compare figures 3B, re-analysed and re-plotted previous observations, and 3C). Transient transfection analysis A. The sequence of the wild-type hTERC core promoter (-107/+69) is shown at the top. The name of each mutant construct is indicated on the left hand side. The number on either side of the sequence is related to the transcriptional start site. Dashes indicate an identical sequence to wild-type. Mutated nucleotides are shown below the wild type sequence. B. Scanning mutational analysis Sp1 sites in the hTERC core promoter Promoter activities of site-replaced mutant constructs: The various symbols or circles represent the different transcription factor binding sites indicated at the top. Transcriptional start site indicated as broken line. The constructs are shown with a black ellipsoid shape indicating a site-replaced mutation in one or more positions and open ellipsoids representing unmodified sites. The promoter activity is shown on the right hand side. Three micrograms of each plasmid were used for transient transfection analysis in 5637 cells. Promoter activities of the mutant constructs were assayed by transfection and compared to the wild-type promoter. The pRL-SV40 vector was used as an internal control to normalise the transfection efficiency. For each transfection the mean and standard deviation of data from three experiments are shown. C. Mutation of Sp1.2 site from PNH patient in 117 bp in length of minimum hTERC promoter increases promoter activity. Thus, the role of Sp1.2 would appear to be dependent on the promoter context. Since both mutations have been shown to disrupt Sp1/Sp3 binding, the present results extend our view of the role of Sp1.2 in the core hTERC promoter, suggesting that Sp1.2 may act as both a positive and a negative regulatory site. This would be consistent with the ability of Sp1 sites to bind both positive or negative regulators and may also be consistent with a scenario in which co-operativity with downstream binding factors might recruit specific factors in a context dependent manner. In totality, the data confirm the role of Sp1.2 as a functional regulator of the hTERC promoter and provide the first evidence that a bona fide hTERC promoter mutation found in a human pathology may modulate core hTERC promoter activity in vitro. The hTERC mutation described in this study affects the core consensus sequence for one of 4 Sp1 binding sites in the core hTERC promoter . 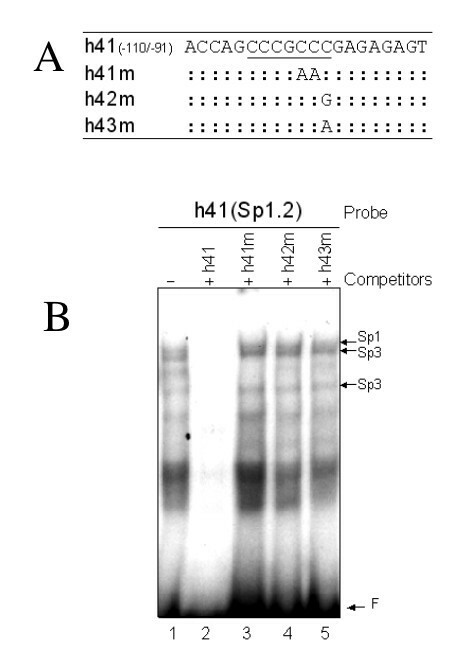 EMSA analysis indicated that the pathogenic mutation destroyed the binding of the transcriptional regulators Sp1 and Sp3 to this site (termed Sp1.2). Transient transfection of hTERC promoter-luciferase constructs confirmed that this site is a functional regulator of hTERC core promoter activity and that introduction of the patient mutation at this site modulates core hTERC promoter activity. Our data show that Sp1.2 has the capacity to mediate both positive and negative regulation of hTERC, in a context dependent manner depending on the other sites available for transcription factor binding in the core promoter. This raises the possibility that Sp1.2 might exhibit functional co-operativity in vivo and that its role might vary, possibly even in a cell-specific manner, depending on the full complement of factors bound to the core promoter. It is tempting to speculate that mutation of Sp1.2 might contribute to the pathogenesis of PNH, especially given recent reports implicating perturbation of hTERC steady state levels in dyskeratosis congenita and in idiopathic aplastic anaemia [5–7]. The picture that is emerging is one in which the role of hTERC levels in the regulation of telomerase in non-malignant tissues may be more important than was previously thought. In support of this argument are the findings that haploinsufficiency of the telomerase RNA component is sufficient to result in shortened telomeres both in autosomal dominant dyskeratosis congenita in humans and in mTerc +/- heterozygous mice [5, 14]. In X-linked DC the mutations in DKC1 are thought to act by reducing the stability of hTERC leading to decreased telomerase levels , though they may also act through a defect in rRNA production . Nevertheless it is interesting that amongst the DKC1 mutations is a point mutation in a conserved Sp1 binding site in the promoter that in vitro has been shown to reduce transcription of the gene . This is the first report of a hTERC mutation in a patient with PNH. This has important implications for the conventional model of PNH development. It is generally accepted that two factors are required for the development of PNH. One is bone marrow failure, in fact PNH clones are found in ~30% of AA patients and ~20% of myelodysplasia (MDS) patients. The second factor is a pathogenic PIGA mutation. The PNH clone is thought to expand because the GPI- cells have a growth or survival advantage over the GPI+ clones in the context of an aplastic bone marrow. The nature of the survival advantage is unknown but is thought to be mediated via one or more GPI linked proteins by an immunological mechanism. The implications of the present findings are that aplastic anaemia caused by a genetic mechanism can also lead to PNH, suggesting the growth advantage of GPI- cells may be more subtle than resistance to cell killing via GPI linked proteins. It has been known for some time that cells from patients with aplastic anemia have significantly shorter telomeres than cells from matched controls [18–20]. This could be due to a direct effect on telomere synthesis or an indirect effect through for example increased cell death leading to increased proliferation of a smaller number of progenitor cells. Studies on PNH patients' telomere lengths have been inconsistent [18, 19] but a recent study of 10 patients with primary classical PNH showed granulocytes with significantly shorter telomeres than controls . Moreover both GPI- and GPI+ cells showed telomere shortening suggesting it reflects the underlying aplastic anemia rather than the proliferation of the PNH clone. It remains to be seen if hTERC mutations or other genetic disturbances of the telomere maintenance pathway are the exception or the rule in AA and PNH. The authors would like to thank Aileen Monaghan for help in construct development. This work was supported in part by a Wellcome Trust Programme Grant. WNK was responsible for the molecular analysis and wrote part of the paper. TV and AM performed the mutation analysis. JZ and AB did the binding and transfection assays. CA and BU examined the patient and provided the DNA. PJM instigated the collaboration and organized and contributed to the writing of the paper. MB provided a series of DNAs from PNH patients. NS and CE provided DNA from the ethnically matched controls. ID oversaw the clinical data analysis and wrote part of the paper. All authors contributed to the writing of the paper.